Nestled on the heart of Himalayan Range, Valley of Flower is sure a feast to the tourist’s eyes. Nearly 300 varieties of wild flowers bloom in this valley. Thus the meadows in this valley are covered by a colorful flower carpet. Amidst of this flowers and sprawling meadows, there are waterfalls and gushing rivers which enhance the beauty of this place. Each flower variety has its unique texture, myriad chromaticity; etc makes the valley a memorable spot to be remembered by the tourists. Heaving to this valley starts from a small hillock settlement namely Govind Ghat, at an altitude of 1800 m. This settlement is located on route from Joshimath to Valley of Flowers. It is pread over any area of 87 sq km and is near Hemkunt Sahib, a holy place of worship of the Sikhs. 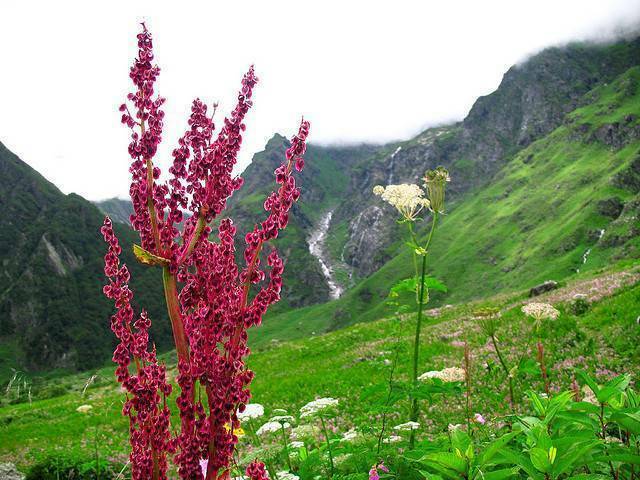 Less than one km from Ghangaria village on the trek, this Valley of flowers is in a full bloom from July to September. Also, no one is allowed to stay overnight thus everyone has to fall back to Ghangaria village. The sight of all full bloomed flowers can be cherished always as the mesmerizing effect stays with you for long. Frank Mische, a British Mountaineer rediscovered this place in the year 1938. There is also wildlife here; keep an eye out for the elusive snow leopard. Camping is not allowed in the Valley of Flowers, tourists must return by 5 pm so plan accordingly. Mid July to mid August is the best time to view the full bloom of flowers in valley.